The County Ground athletics track is not visible from the road. There are entrances on Shrivenham road by Mitchell Cycles for walkers and cyclists. Also from the magic roundabout for non-motor traffic. All vehicles will need to enter the County Ground via County road. There are 3 entrances, the one nearest Manchester road is for exhibitors and takes you directly to the Athletics track, past the cricket club. The other two entrances for event parking are at either side of the County Road pub. We’re behind the stadium, hope to see you there! The ideal way to get to a cycle festival is to cycle! Swindon has over 100km of traffic-free cycle paths. 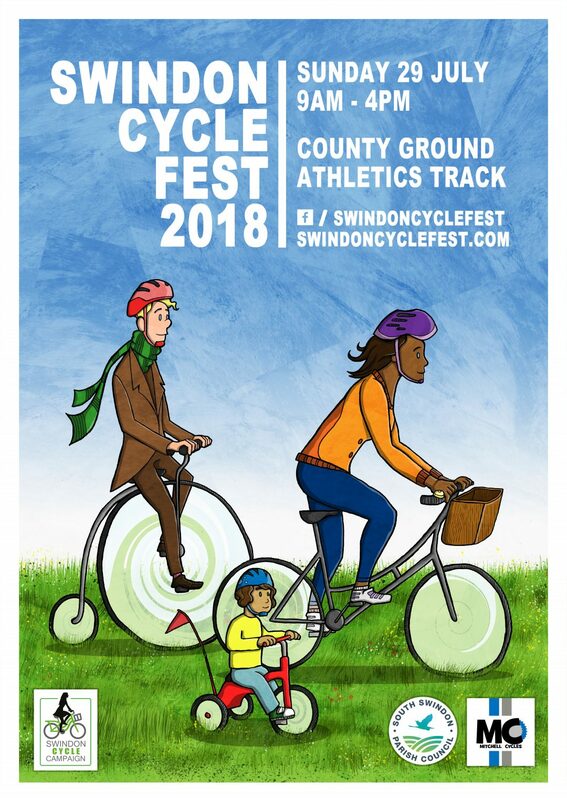 You can pick up a free Swindon Cycle Map from your local library or download one here. There’s lots of free bike parking at the event, but please remember to lock your bike up. The County Ground Athletics Track is in a perfect central Swindon location, next to the world famous Magic Roundabout! Avoid the stress of traffic and enjoy some fresh air. Use the Swindon Travel Choices journey planner if you are unsure of the route. Thamesdown bus services 2, 13, 14, 17 and 18 stop nearest the County Ground site by the Magic Roundabout. All Swindon buses stop at Fleming Way or Swindon bus station, which is only 10 minutes walk away from the County Ground. From here follow Fleming Way towards the Magic Roundabout. The Athletics Track is situated behind the County Ground Stadium next to a large field and the Cricket Club. It is only a 10 minute walk from Swindon Station to the County Ground Athletics Track. There are regular train services which stop at Swindon, for details please visit the National Rail website. On exiting the station cross Station road and walk along Wellington Street towards the Town Centre. After around 100m turn left and follow Manchester road all the way along until you reach County Road. Turn right, cross the road and then turn immediately left, this lane will lead you to the Athletics track. Free car parking is available at the Swindon County Ground Stadium, off County Road. From here it is only a couple of minutes walk to the Swindon County Ground Athletics Track (the route will be signposted). Please note, there is limited car parking available directly outside the Athletics Track and this will be reserved for event exhibitors and Blue badge holders only. Leave the M4 at Junction 15. Take the Commonhead Roundabout. Turn left onto the A4259 Marlborough Road. Take the 2nd exit at the roundabout onto Queens Drive. At the next set of roundabouts take the 3rd exit onto County Road the entrance to the ground is on the first right. Take the M40 to Junction 9. Then take the A43, A34 and then the A420 into Swindon. At Drakes’ Roundabout turn onto Queen’s Drive. At the next set of roundabouts take 3rd exit onto County Road, the entrance to the stadium is the first right.